This book introduces readers to the dynamic response of structures with important emphasis on the material behavior under dynamic loadings. It utilizes theoretical modelling and analytical methods in order to provide readers with insight into the various phenomena. The content of the book is an introduction to the fundamental aspects, which underpin many important industrial areas. These areas include the safety of various transportation systems and a range of different structures when subjected to various impact and dynamic loadings, including terrorist attacks. Presented in three parts—Stress Waves in Solids, Dynamic Behaviors of Materials Under High Strain Rate, and Dynamic Response of Structures to Impact and Pulse Loading—Introduction to Impact Dynamics covers elastic waves, rate dependent behaviors of materials, effects of tensile force, inertial effects, and more. The book also features numerous case studies to aid in facilitating learning. The strength of the book is its clarity, balanced coverage, and practical examples, which allow students to learn the overall knowledge of impact dynamics in a limited time whilst directing them to explore more advanced technical knowledge and skills. 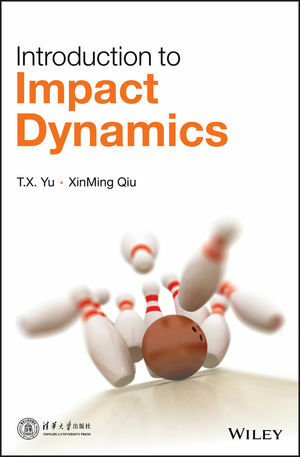 Introduction to Impact Dynamics is the perfect textbook for graduate and postgraduate students, and will work as a reference for engineers in the fields of solid mechanics, automotive design, aerospace, mechanical, nuclear, marine, and defense. T.X. Yu, PhD, is Professor Emeritus at the Department of Mechanical Engineering, The Hong Kong University of Science and Technology, Hong Kong. XinMing Qiu, PhD, is Professor at the School of Aerospace Engineering, Tsinghua University, Beijing, China.